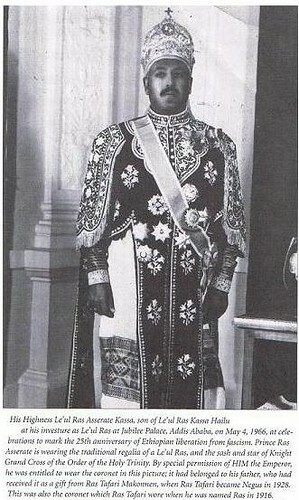 Leul Ras Asrate Kassa was a senior Prince of the Blood, and the head of the cadet Selale Branch of the Imperial Dynasty of Ethiopia after the death of his father, Leul Ras Kassa Hailu. He was the son of Leul Ras Kassa Hailu and Princess Tsige Mariam Beshah of Merhabete. The Prince was the youngest son of his parents, and accompanied them into exile during the occupation of Ethiopia by fascist Italy. As a result he survived his elder brothers, Dejazmatches, Wondwossen, Asfaw Wossen, and Abera Kassa, who were all executed by the Italians for resisting the occupation. He returned to Ethiopia with his father and the Emperor and participated in the war of liberation in 1941. he attended Sandhurst in the United Kingdom and would serve as a high ranking officer in the post-liberation era in Ethiopia. The then Leul Dejazmatch Asrate Kassa was a key figure in the failure of the 1960 Imperial Coup d'etat against the Emperor. Having eluded capture by the plotters, he helped co-ordinate the civilian and military opposition to the coup. He succeeded his father as head of the Selale branch of the Imperial family, and served in a number of senior government possitions, among which were Vice Roy in Eritrea and President of the Crown Council in succession to his father. He was regarded as the head of the conservative faction at the Imperial court, which tried to resist the more modernist trends of the government of Prime Minister Aklilu Haptewold, whose non-aristocratic roots were regarded as insufficiently monarchist by the conservative elements at court. When military and student unrest brought down the Prime Minister in 1973, the Prince was among the leading voices who called for the elevation of a member to the nobility to the Prime Ministership. Due to his Imperial blod which was as royal as that of the Emperor's children, the Ras was often mentioned as a possible future monarch if the Emperor's line was unable to hold the throne. Prince Asrate Kassa was among the most senior figures arrested by the Derg in what was known as thier "creeping coup" where officials were slowly and gradually eliminated by being placed under arrest over a period of months. He was married to Princess Zuriashwork Gebre Igziabher, daughter of Jantirar Gebre Igziabher and maternally a granddaughter of Ras Mulugeta, the long time Minister of War during the reigns of Empress Zewditu and Emperor Haile Selassie. He was executed by the Derg on November 23rd, 1974 with 61 other ex-officials of the Imperial government, and was the most senior member of the Imperial Dynasty executed that day. He is shown on the day he was elevated to the title of Leul Ras (Prince Duke) from the title of Leul Dejazmatch (Prince Earl) by Emperor Haile Selassie.